Yes, it is once again Fat Tuesday and while toying with the idea of baking semlas, and weighing against the fact that I had lots of the buns left over from last year, the lovely ladies at HR (where I work) went ahead and ordered several crates for the whole office to celebrate. So my mind went on spinning - moving down to a smaller scale, maybe on a lolly stick, hm? 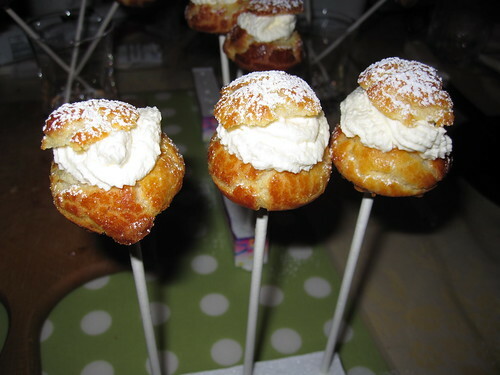 And so I got the idea of a semla pop. And I googled it, there was nothing of the kind. But of course semla buns are from yeast dough, there is no way I could get them that small. And then be able to scoop out the crumb in the middle in order to fill with marzipan etc. Then it struck me - choux buns! They pretty much have a hole in them per definition. And I wouldn't be fiddling with marzipan, crumbs and milk etc for the filling, just push in a small pinch of marzipan, squirt a little whipped cream, put the lid on and dust with icing sugar. The whipped cream, was just that - whipped cream with a couple of tsp of icing sugar added to it. And that's precisely what I did and even my parents liked them, to the point that we put away the 9 pops I made straight away, leaving barely enough time for photos. So this is what I did. One batch of choux buns of previously tried and tested recipe. It ended up a bit runnier than I expected, not sure why and as I piped slightly smaller blobs, I ended up with about 75 of them. Once they had cooled completely, I carefully cut off the tops of a few as the semla lids. Into the cavity I placed some marzipan, about the size of a hazelnut and pushed a lolly stick through. As you can see this time I had polystyrene pieces, which I saved after the candles on Falbala's latest birthday cake. A little Blu-Tack worked a treat. It occurred to me that I should have cut the lids into triangles, but with my Mum and Dad standing next to me and not really succeeding in waiting for me to finish constructing my little semla pops, I didn't bother. 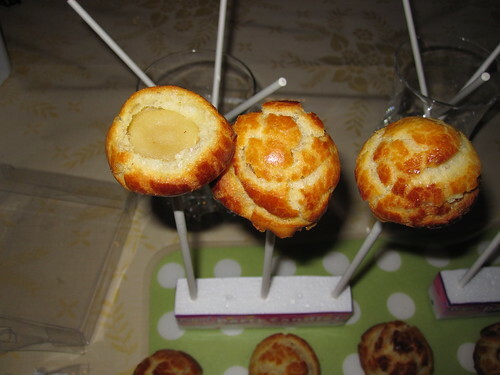 On further thought, the lolly sticks aren't really necessary, the mini-semlas work quite nicely as bite-sized treats and as it turned out, survived a night in the fridge without problems, which was a massive bonus. I decided not to take the risk of a second night in that cold place and ate the few remaining survivors for breakfast the next day. My original plan was to make the whole lot into semla pops and take to work, sadly I fell the victim of this year's heavy duty flu and ended up working from home most of last week, so as only bonus I got to keep all the little semlas. As for the flu, I've mostly kicked it, it seems, but according to the Swedish news, it's the worst epidemic in 20 years. Yes, it is Valentine's Day, in Swedish the day translates to "the day of all hearts". And on a recent trip to our local mall, I spotted these adorable pink heart-shaped sprinkles and couldn't stop myself from buying them. Pathetic, I know. Since the chocolate muffins I made for the cookie monster cup cakes were so fluffy and light and moist and generally extremely tasty, I decided to make them again, but a double dose this time, as I planned to take some to work. You see, my colleague, Long Tall Sally, keeps grumbling occasionally over that I didn't bring any of the cookie monsters to work. The muffin recipe is here. From the double dose I got 28. For the topping, I had some mascarpone left over and wanted to use it up, so I searched for suggestions on the vast source of inspiration that is the Internet and found this recipe that seemed very appealing. I still ended up buying another packet of mascarpone and as I was taking the cupcakes to work, I decided against the madeira. Whisk together the mascarpone and icing sugar until it is soft. In a separate bowl, whip the cream to medium peaks. Stir together carefully until well incorporated. Cover with clingfilm and place in the fridge until needed. Once the muffins were ready and completely cooled down, I piped as much cream as I dared. The above amount was actually just right. 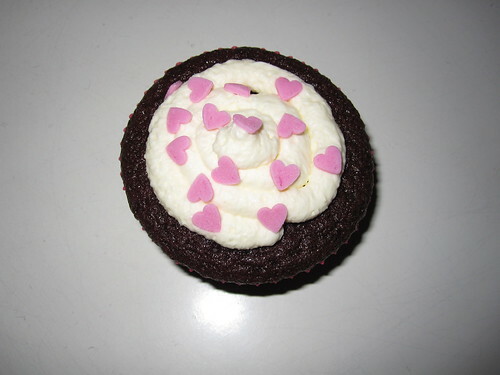 The mistake I made was to sprinkle the little hearts immediately afterwards. By the morning they had soaked up some moisture from the cream and had started dissolving. Such a beginner's mistake to make. Then came another problem - transportation. My friend Patsy has invested in a special carrying box, but there was no way I could borrow it now. Gah! So out with all ice cream boxes and then fit in as many as possible without destroying them. I managed to take 14 with me to work and they certainly seemed popular, despite they were pink and dissolved. In fact, Long Tall Sally asked to take all of them. As always, my piping capabilities leave a lot to be desired, but the mascarpone cream was fantastic and combined very well with the muffins. Definitely a repeat treat. Yesterday it was my Mum's birthday and after some discussions we agreed to make a tiramisu cake for her. Discussing further, I mentioned that I fancied trying a particular cake shape. My Mum disagreed - she wanted a BIG cake. But when I came to make it, she was busy doing something else, so I took the opportunity to do what I'd decided to do anyway. The cake shape in question is a giant brioche basically, but made from pyrex and is also useful for a Charlotte. Another thing on my to try list. The recipe for the mascarpone cream comes from a book on Italian food, something I purchased for my Mum at least 20 years ago, long before the people of Sweden knew what pesto is. The below results in quite a lot, if you're making portion sized tiramisu, only do half of this, it should be enough for 8 - 10 people. 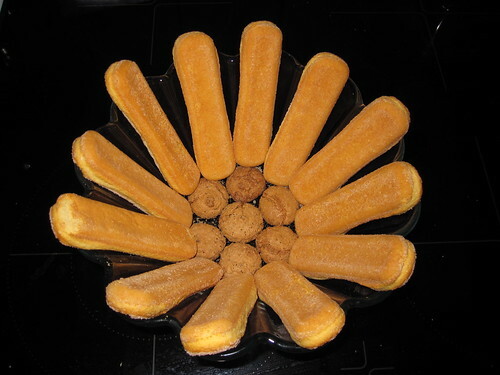 Mix half of the rum and half of the Cointreau with the coffee in a shallow and wide bowl, to allow for a quick dip of the ladyfinger biscuits. Line the big brioche dish with dry ladyfinger bisquits and some of the small amaretti biscuits at the bottom and set aside. Turn out the mascarpone into a separate bowl and stir to loosen. Add the egg yolks, the remaining rum and Cointreau and the icing sugar and stir together well. In a clean metal or glass bowl, whisk the egg whites to stiff peaks. Carefully fold the whites into the mascarpone mix and incorporate well. Pour a little of the mascarpone mixture into the brioche bowl, just enough to cover the amaretti biscuits at the bottom. Spread so as not to leave air bubbles. Dip some amaretti biscuits into the coffee mixture briefly and place on top of the cream, try to fit in as many as possible. 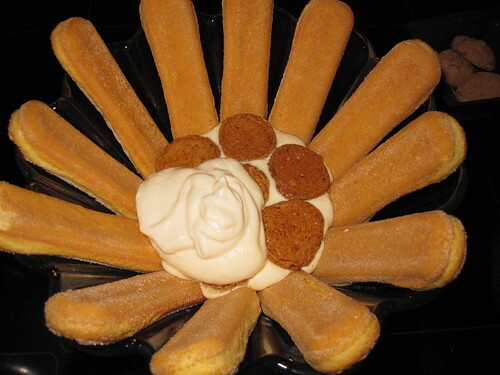 Spoon another layer of the mascarpone cream to cover, then quickly dip some ladyfinger biscuits and fit over the cream. 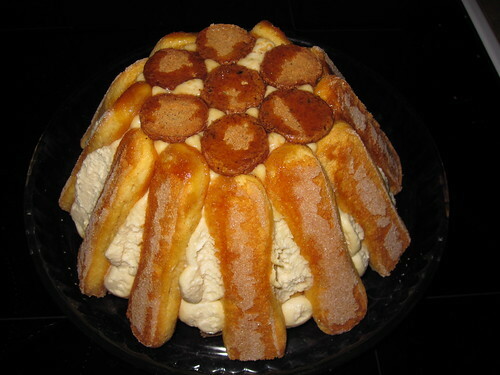 Repeat one more time until the brioche bowl is filled, finish with a layer of ladyfinger biscuits. Cover with clingfilm and let stand overnight. Before serving, if any of the outer ladyfinger biscuits are sticking out, trim them so that they are level with the bottom layer of the cake. 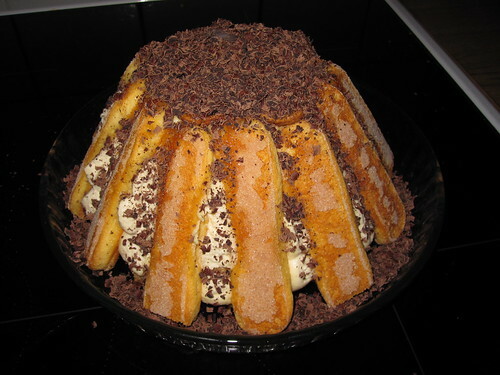 Then turn over the brioche bowl onto a serving plate and carefully remove from the tiramisu cake. Grate the dark chocolate and sprinkle on top. Because I wanted this thing to stand and not collapse like my other creations, I opted to keep some of the ladyfinger biscuits dry. This worked, but the cake felt a bit on the dry side, so should perhaps have dipped some of them. I also think the balance between rum and Cointreau was off - too much rum, not enough Cointreau, and so it felt quite boozy and not in a good way, at least I didn't think so. Next time I'll adjust it - maybe equal amounts would be better. I also had quite a lot of mascarpone cream left over, so I made 6 portion glasses with a ladyfinger each. Looking at my photos, I should have saved the cream and used it to make the outward appearance a bit smoother, before sprinkling the chocolate. Needless to say we put away half of this on the day of celebration and my parents worked through the remainder on the following day. But I'm glad that my idea worked and that the cake was able to stand on its own. While I was a housewife in 2010, I followed several blogs and gathered quite a lot of interesting recipes. More than I have had time to try out. 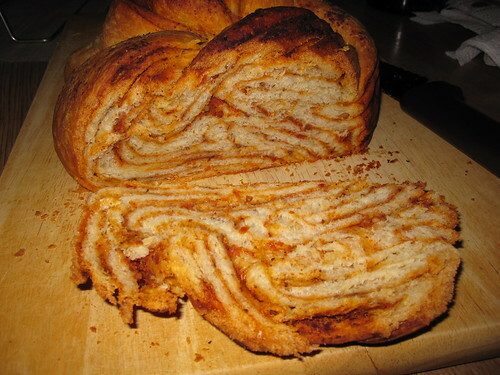 One of these comes from TheFreshLoaf and is a bread recipe from the Caucasus. The photo there looked so pretty and the technique seemed quite intriguing, I'd even gone to Borough Market to get hold of Sumac, a spice I'd never heard of before. 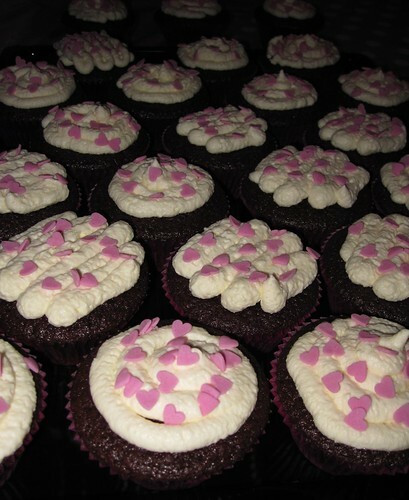 I haven't baked for some time (it took forever to eat all the cupcakes! 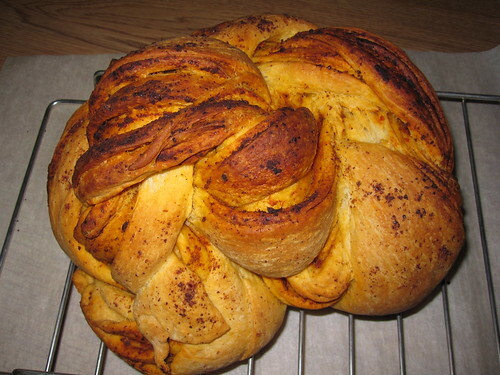 ), so I thought I'd finally try making this fascinating bread. Despite relatively thorough preparations, it turned out that I didn't have all the listed ingredients and had to improvise. Put all the dry ingredients in the bowl of the mixer. Mix together well, then pour in the oil and the vinegar and the water and continue mixing until a supple, non-sticky dough forms. If it feels a bit stiff, add a bit more water, if too soft, add a little more flour. Cover the bowl and set to rise in a warm place until double in size. In the mean time, cut out a rough circle, slightly larger than your springform, then fit onto the bottom part and clip into the other. Brush the sides and bottom with olive oil. 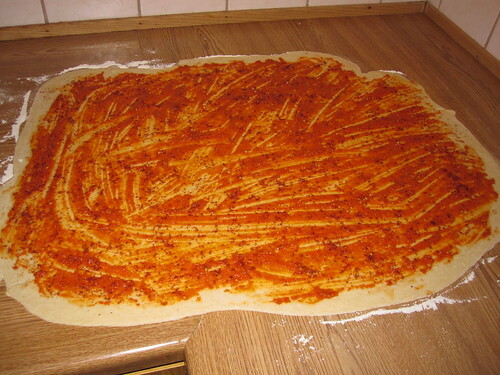 Flour your work surface and your rolling pin and take out the dough. Flatten it out and start rolling to a sheet, as thin as possible and into a rectangular shape, I managed to get it about 3-4 mm. Spread a thin layer of the pesto, leaving the outer 1 - 1.5 cm, then sprinkle a little sumac all over. Carefully roll up along one of the long sides, as tightly as possible. Then cut lengthwise through the middle of the roll, using a sharp, non-serrated knife. Do not saw with the knife. 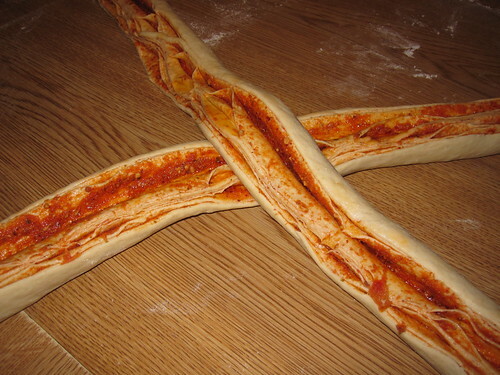 It should be two very long roll halves. Place the two halves so that they form an X and with the cut surface upwards. 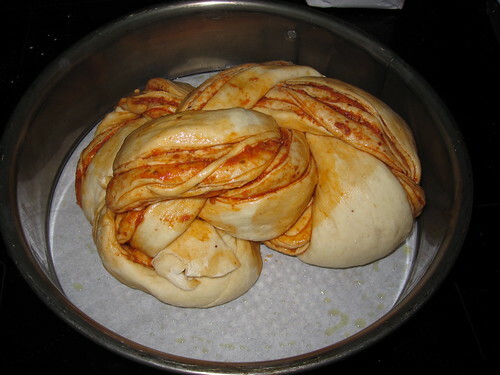 Braid the two parts together by taking the two bottom ones and crossing over the top ones. Twist so that the cut surface always remains upwards as you go along. Tuck in the ends when done, or pinch together.You should now have a rope-like thing. 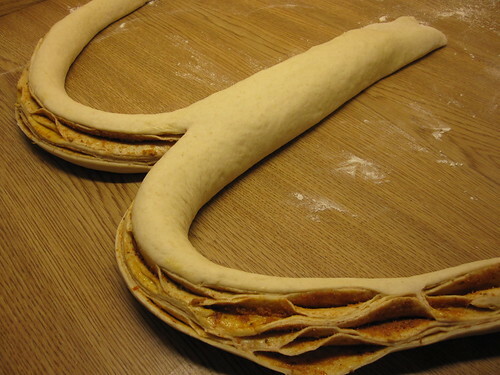 Now starting with the thinner end of the dough, roll it carefully sideways into a spiral, like a huge cinnamon bun. Carefully transfer the bread to the springform and let proof. Brush with some more olive oil and sprinkle with more sumac on top. Bake in the middle of the oven for 10 minutes, then turn down the heat to 180 degrees and let bake for a further 30 - 40 minutes until done. If it goes dark on the top, place a sheet of baking paper to prevent it from burning. Although my roll was fairly long, it appears it wasn't long enough and I need to practice the braiding and see if I can work out a different way of doing it that will give a more attractive result. There was no way I could bend it into a spiral shape, let alone getting it to fit into the springform in any way at all, but anyway, I continued. the way they sometimes do them in Bulgaria. Except that this was far from sweet. and I was kind of sold on it. So pretty! Taste-wise it was quite OK, there seemed to be a persistent smell of vinegar around it, and sumac also having a sour flavour, maybe that added to the whole, but it wasn't obvious in the taste, just the smell. I'll try this again sometime, but with traditional pesto and make sure to roll even longer, so I get a nice braid.